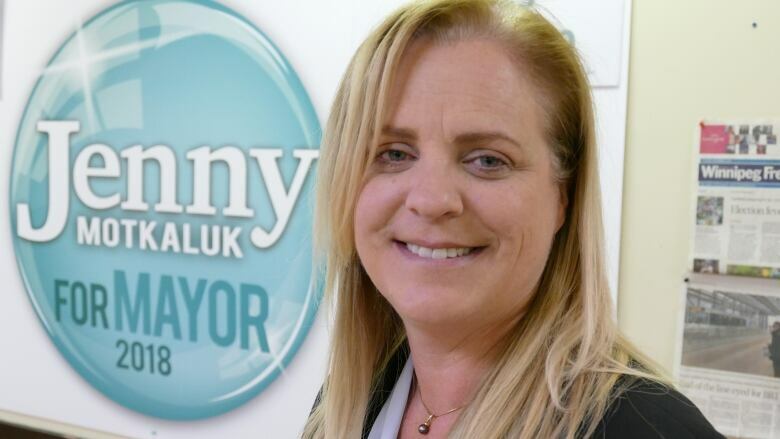 Mayoral candidate Jenny Motkaluk is promising to freeze Winnipeg water-and-sewer rates until the city conducts an audit of the way it spends money on wastewater upgrades. Winnipeg is in the midst of a decades-long program of replacing combined sewers and upgrading sewage treatment plants at a cost expected in the billions by the time it's finished. To pay for the upgrades, the city has been raising water-and-sewer rates for more than a decade. Motkaluk said Tuesday not all of the proceeds from these hikes have been spent on the projects in question. Motkaluk blamed incumbent mayoral candidate Brian Bowman for allowing rates to increase. "It's just another example of Mr. Bowman's 'put on a happy face and our best days are here' charade," she said at her campaign headquarters on Ness Avenue. Motkaluk said too little money has been spent on the largest component of the wastewater program, the upgrades at the North End Water Pollution Control Centre, which are expected to cost $1.4 billion. Most of the work on the project, however, has not been tendered yet. Bowman said water-and-sewer hikes are needed to put away money for the project. Motkaluk said she is not certain whether she would end Winnipeg's practice of drawing a dividend from water-and-sewer revenue. This year, the city will draw $15.5 million from water-and-sewer revenue and use that money to bolster its $1.08-billion operating budget. Bowman pledged earlier in this campaign to freeze the water-and-sewer dividend rate next year but not freeze the actual draw.